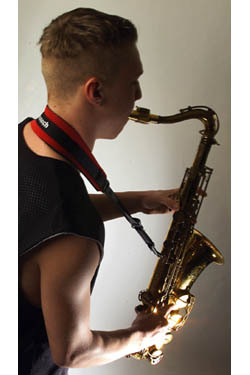 After many, many years of using ropes masquerading as straps which left my neck suffering from Chinese burns, one of the Blowout Sax students returned from the US with one of these Neotech slings. I got hold of one and no longer did my neck and shoulders look red, rashy and as though I had just come from an S and M session! 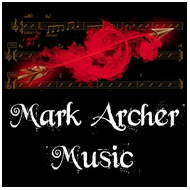 You do have to get over the feeling of thrusting your sax outwards and it springing away from you, and it getting a little clammy when you are sweating on stage, but that aside, the soft, elasticated strap really does take about fifty per cent of the weight of the instrument away. 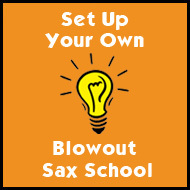 Try to have a hook which has a swivel on it so the sax feels very secure. The use of cheap and nasty straps often ends in tears; I've seen plastic hooks snap and the saxes attached to them crash to the ground to the stunned disbelief and horror of both student and teacher. Neotech straps & harnesses are even more ideal for those with back problems, and they come in various sizes lengths and all sorts of colours. The choice is yours. 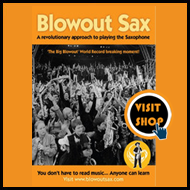 Here at Blowout Sax we believe you will never regret the quality of this sling.Fantastic.